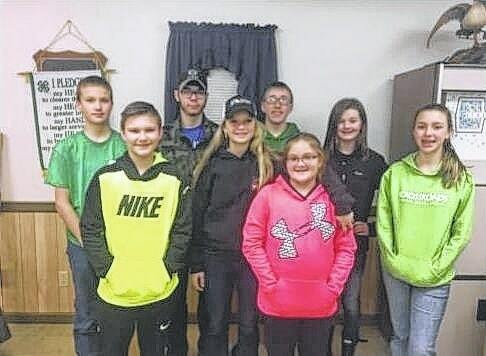 New officers were elected at a recent Fayette Firearms 4-H club meeting. Front row, from left to right, Jayden Brown, Anita Pursell, Mallori Mitchem and Alex King; back row, from left to right, Kyler Batson, Jacob Brown, Ben Speakman and Lexi Hagler. The first meeting of the season for the Fayette Firearms 4-H club was held at Fayette County Fish and Game Lodge on Tuesday, Jan. 10 at 6:30 p.m. During the meeting, the old minutes were read and new officers for the 2017 year were elected. The next meeting will be held at the Fayette County Fish and Game Lodge on Tuesday, Jan. 24 at 6:30 p.m. All club members are looking forward to a fun and successful 4H year! https://www.recordherald.com/wp-content/uploads/sites/27/2017/01/web1_FayetteFirearm.jpgNew officers were elected at a recent Fayette Firearms 4-H club meeting. Front row, from left to right, Jayden Brown, Anita Pursell, Mallori Mitchem and Alex King; back row, from left to right, Kyler Batson, Jacob Brown, Ben Speakman and Lexi Hagler.